It’s been a while since I last posted….a week actually! Lots of great things in the works. Just wrapped up our first ever photo shoot (culling through 3000 images), currently choreographing for two shows (will have to share my Ruby Blue routine if I get decent video), and getting ready for the SJ Made show–where we’ll have a table with all our lovely dance gear. One of my dancer/ choreographer friends shared this video (thanks, Christine!). Ummmm yeah sometimes I can get like this. Hahhahaha. I’m loving the “it’s a 17-count, all the greats do it”. This weekend, The Pulse On Tour stopped in Santa Clara at the Hyatt Regency. It was two-days of intense, inspiring classes with amazing choreographers from So You Think You Can Dance, Step Up, music videos, and more. And us girls were pretty lucky since we got the all-male line up. We took classes with Gil Duldulao, Brian Friedman, Chris Judd, Tyce Diorio, Wade Robson, and Dave Scott. The choreo, songs, genres, all of it was breathtaking. Literally, I got pretty worked on the second day, but it was so worth it. All the choreographers were so good–it’s hard to pick a fave routine. But I do have to say Dave Scott is my favorite choreographer of all time. His choreo is fun, intricate, high energy, and he has this way of putting in moves that play off the words in the songs that just takes it to a whole other level. Plus, he did a Lil Wayne piece–now you know I got a soft spot for Lil Wayne! *I gave him a GR t-shirt (the Eat. Sleep. Dance. Repeat. one) yesterday–hope he likes it. I think as a dance instructor it’s nice to learn from others, especially those who are at the top of our profession. It’s nice to be challenged and pushed out of our comfort zones. I loved every moment of it. It’s all inspiring and has only made me a better dancer. Being a dancer seriously is one of the best things ever! I couldn’t imagine a life without dance. Do check out thepulseontour.com for upcoming events. I might see you in NYC! Elemental Remix girls with Wade Robson. With my favorite choreographer, Dave Scott. 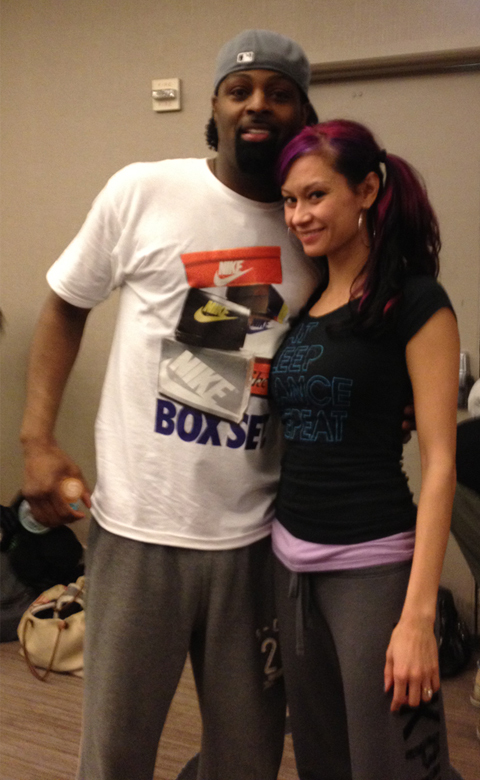 I love this choreographer, Jaz from Mega Jam based in Australia! We tend to choose the same songs to choreograph to, but she’s like a 100 times better than me. I love how girlie and clean her movements are, and her musicality is ridiculous. You can actually see all of the beats in the music.